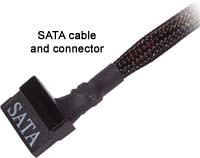 SATA (Serial Advanced Technology Attachment) - SATA is an evolution of the Parallel ATA physical storage interface. Serial ATA is a serial link - a single cable with a minimum of four wires creates a point-to-point connection between devices. Transfer rates for Serial ATA begin at 150 MBps and SATA II 300MBps. This newer specification that offers a number of benefits including: Faster throughput, thinner 7-pin cable (as opposed to the IDE 40 pin ribbon cable) that promotes better airflow through the case, support for longer cables, and hot-swappable. In addition, there are no jumpers to worry about because each device connects to its own controller channel. Schema - When referring to Active Directory, a schema defines the list of attributes that describe a given type of object. For example, let's say that all printer objects are defined by name, PDL type and speed attributes. This list of attributes comprises the schema for the object class "printers". The schema is customizable, meaning that the attributes that define an object class can be modified. Schema Master - The schema master FSMO role is the DC responsible for performing updates to the directory schema. This DC is the only one that can process updates to the directory schema. Once the schema update is complete, it is replicated from the schema master to all other DCs in the directory. There is only one schema master per directory. SCSI (Small Computer Systems Interface) - Prounounced "Scuzzy", SCSI is an alternative to the IDE interface for connecting mass storage devices. SCSI is faster than IDE, however, because of its cost SCSI devices are most commonly found in servers and high-end workstations. SCSI devices, such as hard drives, tape drives, and CD-ROM drives, plug into a SCSI controller internally or externally, and multiple devices can be configured in a chain. In order for the SCSI bus to work correctly, the last device on any SCSI chain must be terminated. Some SCSI devices are self-terminating, while others can be terminated using jumpers or a resistor that plugs into the end of the cable or device. Each device on a SCSI chain must receive its own SCSI ID including the controller which is usually preset to ID 7. Newer SCSI standards support up to 16 devices in a chain. SDRAM - Stands for Synchronous DRAM and has replaced regular DRAM because of its faster speeds.Whilst DRAM has an asynchronous interface, meaning that it reacts immediately to changes in its control inputs, SDRAM has a synchronous interface, meaning that it waits for a clock pulse before responding to its control inputs. The clock is used to drive an internal finite state machine that can pipeline incoming commands. This allows the chip to have a more complex pattern of operation than plain DRAM. SDRAM is probably the most commonly used memory type today. SDR SDRAM - Stands for Single Data Rate SDRAM, a type of computer memory. The term is used to contrast with Double Data Rate SDRAM, or DDR SDRAM, but since single data rate SDRAM was the only sort available when SDRAM was introduced, it is more commonly called "ordinary SDRAM" or something similar, rather than "SDR SDRAM". Secure Digital Cards - Secure Digital (SD) cards are the most commonly used format today after displacing a similar type by SmartMedia. SD cards come in 2 types: SD and SDIO. Both are identical looking so you need to check with the manual or manufacturer of your device to find which to use. SD cards are smaller than CompactFlash, but come in 2 even smaller sizes: MiniSD and MicroSD are smaller versions that are commonly used in cell phones. Seek Time - This is the amount of time it takes for a hard drive's head to move between cylinders and land on a particular track. SET (Secure Electronic Transaction) - SET gives users a digital certificate and a transaction is conducted and verified using a combination of digital certificates and digital signatures among the parties involved in the transaction in such a way that ensures privacy and confidentiality. SFTP (Secure File Transfer Protocol) - Similar to standard FTP but performs operations over an encrypted link (SSH) and is thus said to be secure. You can't use a standard FTP client to talk to an SFTP server, nor can you connect to an FTP server with a client that supports only SFTP. SFTP was written independently of FTP and is a completely separate protocol. SHA (Secure Hash Algorithm - A family of related cryptographic hash functions. The most commonly used function in thegroup, SHA-1, is used in a large variety of security applications and protocols, including IPSec, TLS, SSL, PGP, SSH, and S/MIME. SHA-1 is considered to be the successor to MD5, an earlier, widely-used hash function. The SHA algorithms were designed by the National Security Agency (NSA) and published as a US government standard. SIP – Stands for Session Initiation Protocol and is a signaling protocol, widely used for controlling multimedia communication sessions such as voice and video calls over Internet Protocol (IP). Other SIP trunking solutions include video conferencing, streaming multimedia distribution, instant messaging, presence information and online games. The protocol can be used for creating, modifying and terminating two-party (unicast) or multiparty (multicast) sessions consisting of one or several media streams. The modification can involve changing addresses or ports, inviting more participants, adding or deleting media streams, etc. Sites - Sites are used to define the boundaries of high-speed links on a network containing Active Directory Servers. Sites are based on IP subnets and are defined as a "well-connected subnet or subnets". Smart Card - The term smart card has been used to describe a class of credit card-sized devices with varying capabilities, however, they are most commonly used for identification, building entry, and financial transactions. The card is typically inserted into a reader device which reads the contents of the ICC chip in the card. It is the ICC (Integrated Circuit Card) that is of most interest to the personal computer because it is able to perform more sophisticated operations such as digital signature and key exchange. Newer operating systems are supporting smart card authentication. Smart Jack – This is a network connection device that is used to connect your internal network to an external service provider network. The device handles all of the code and protocol differences between the two networks and is often the actual demarcation point between the two service entities. SMF (Single-Mode Fiber) - A single-mode optical fiber is an optical fiber in which only the lowest order bound mode can propagate at the wavelength of interest. Single mode fibers are best at maintaining the signal of each light pulse over longer distances and exhibit no dispersion caused by multiple modes. The result is that this type offers a higher bandwidth in comparison with multi-mode fibers (MMF). 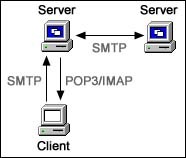 SMTP (Simple Mail Transfer Protocol) - SMTP is a member of the TCP/IP protocol suite and is responsible for the delivery of mail between mail servers. SMTP is also used in most cases to deliver mail from the email client to the mail server. SMTP does not handle the transfer of mail from the mail server to the client (i.e. Outlook) - POP3 or IMAP is responsible for that. SMTP uses port 25. Smurf Attack - This is a type of denial-of-service attack that floods a target system via spoofed broadcast ping messages in an attempt to cause massive network traffic. To accomplish this, the attacker sends ICMP echo packets to broadcast addresses of vulnerable networks with a forged source address pointing to the target (victim) of the attack. All the systems on these networks reply to the victim with ICMP echo replies which will overload it. These types of attacks are very easy to prevent, and as a result, they are no longer very common. SNAT – Secure Network Address Translation an extension of the standard Network Address Translation (NAT) service. SNAT is done through one to one IP address translation of one internal IP address to one external IP address where NAT is effectively one external address to many internal IP addresses. SNMP (Simple Network Management Protocol) - Part of the TCP/IP suite of protocols, SNMP is a protocol used by network hosts to exchange information used in the management of networks. SNMP network management is based on the client and server model. Each managed host runs a process called an agent. The agent is a server process that maintains the Management Information Base (MIB) database for the host. SNMP is used to report usage, statistics, errors, performance metrics and other information from a SNMP device to the agent. Social Engineering - Social engineering describes various types of deception used for the purpose of information gathering, fraud, or computer system access. Phishing, a form of social engineering, is the fraudulent process of attempting to acquire sensitive information such as usernames, passwords and credit card details by masquerading as a trustworthy entity in an electronic communication such as email, chat, or instant messaging. SPX (Sequenced Packet Exchange) - A Novell networking protocol that provides guaranteed in-sequence delivery of packets on Novell Netware networks. SPX runs in conjuction with IPX and provides a layer of error correction. SONET (Synchronous Optical NETwork) - SONET and SDH are a set of related standards for synchronous data transmission over fiber optic networks. SONET is the United States version of the standard and SDH is the international version. SONET defines a base rate of 51.84 Mbps and a set of multiples of the base rate known as "Optical Carrier levels." (OCx). Speeds approaching 40 gigabits per second are possible. SRAM - Stands for Static Random Access Memory. SRAM is faster and more reliable than Dynamic Random Access Memory (DRAM) and it doesn’t have to be constantly refreshed. Uses a lot of power. Used in old IBM XT machines and was limited to 256K per chip. SSH (Secure Shell) - Developed by SSH Communications Security Ltd., SSH is a program and network protocol used to remotely access a computer, login, and execute commands on it. It is very similar to Telnet, but is better because it provides secure encrypted communications while Telnet has been found to be exploitable and insecure. SSH uses public-key cryptography to authenticate the remote computer and utilizes port 22. SSI (Server Side Includes) - SSI provides a way to create templates for static elements of HTML web pages. In other words, elements that are the same across all of pages of a web site such as menus, sidebars, etc. The advantage of using includes is that you don't have to update all of the pages of the site when an element in your include file changes - you just have to update the 1 include file. SSI pages are typically called using the following syntax: <!--#include virtual="/path/to/include_file"-->. The pages of the web site should be given the .shtml or shtm extension and the include files use the .html extension. SSL (Secure Sockets Layer) - SSL is a protocol developed by Netscape used to provide secure transmission of private documents over the internet. It is most commonly used for e-commerce applications such as the creating secure HTTP pages (HTTPS) that protect confidential information such as credit card numbers during online purchases. SSL uses the public- and private-key encryption system, which includes the use of a digital certificate. SSL VPN (Secure Sockets Layer virtual private network) - This is a VPN that runs on SSL and is accessible via https over a web browser. It allows users to establish secure remote access sessions from virtually any Internet connected browser. Unlike a traditional VPN, this method does not require the use of IPSec. The benefit of this solution is that it allows clients to access a corporate network from nearly anywhere which is not practical with a typical VPN. SSTP (Secure Socket Tunneling Protocol) - SSTP is a form of VPN tunnel that provides a mechanism to transport PPP or L2TP traffic through an SSL 3.0 channel. SSL provides transport-level security with key-negotiation, encryption and traffic integrity checking. The use of SSL over TCP port 443 allows SSTP to pass through virtually all firewalls and proxy servers. Star Topology - Star networks are one of the most common network topologies used today. In a star topology, the workstations, fileservers, printers etc. are attached via drop cables to a central hub or switch. This central hub rebroadcasts all transmissions received from any peripheral node to all peripheral nodes on the network. Should this central hub fail, devices on the network will not be able to communicate with each other, however, the failure of a node connected to the hub will not affect communications between the remaining nodes. STP1 (Shielded Twisted Pair) - This type of cable is the same as unshielded twisted pair (UTP), except that it has shielding around it to provide more protection against electromagnetic interference (EMI). STP2 (Spanning-Tree Protocol) - STP allows duplicate switched/bridged paths without incurring the latency effects of loops in the network. The Spanning-Tree Algorithm, implemented by the Spanning-Tree Protocol, prevents loops by calculating stable spanning-tree network topology. When creating a fault-tolerant network, a loop-free path must exist between all nodes in the network The Spanning-Tree Algorithm is used to calculate a loop-free paths. Spanning-tree frames, called bridge protocol data units (BPDUs), are sent and received by all switches in the network at regular intervals and are used to determine the spanning-tree topology. 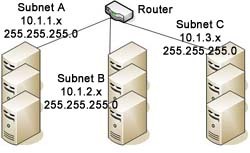 Subnet - A subnet is a logical grouping of connected network devices. Network designers use subnets as a way to divide networks into logical segments for greater ease of administration, improved security, and better performance. In IP networking, nodes on a subnet share a contiguous range of IP address numbers. A number called a subnet mask blocks out a portion of an IP address and is used to differentiate between the host ID and network ID. Switch - A switch is a network device that filters and forwards packets between LAN segments and ensures that data goes straight from its origin to its proper destination. Switches remember the address of every node on the network, and anticipate where data needs to go. It only operates with the computers on the same LAN. This reduces competition for bandwidth between devices on the network. Syn Flooding - In a SYN Flood attack, the client uses an unavailable IP address so that the server's SYN-ACK message never reaches its destination. This results in a "half-open" connection. The attacker floods the server with these types of requests making the server unable to respond to new valid requests. Synchronous - In telecommunication signaling within a network or between networks, synchronous signals are those that occur at the same clock rate when all clocks are based on a single reference clock. In program-to-program communication, synchronous communication requires that each end of an exchange of communication respond in turn without initiating a new communication. A typical activity that might use a synchronous protocol would be a transmission of files from one point to another. As each transmission is received, a response is returned indicating success or the need to resend. Each successive transmission of data requires a response to the previous transmission before a new one can be initiated.